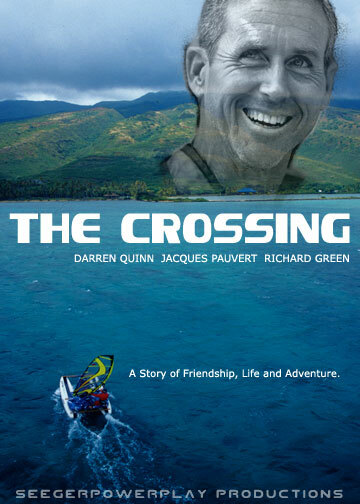 In 2003 Darren Quinn, Jaques Pauvert and Richard Greene began the design phase of one of the most extraordinary windsurfing project in the history of the sport. Jaques and Darren mused on what it would take to enable someone in Darren’s physical condition to have a true windsurfing experience. They went to Maui based board builder Richard greene who is considered amongst the best in the world. The meeting resulted in a series of design experiments and the beginning of a life long friendship. 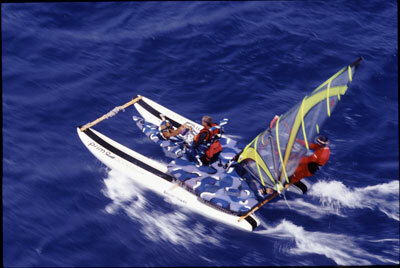 After several trial models, they finally reached a design based on a catamaran with a three hulled front end that put Darren out in the thick of the action, was stable enough to carry both sailors and fast enough to cross the Molokai channel, an eight mile stretch of rough ocean between Maui and Molokai. To prepare for the expedition Darren learned to scuba dive using an air tank to breath incase the cat-sail should capsized during it’s journey. On the day of the crossing everyone came out to support Darren. As he and Jacques sailed they were flanked by crew on 4 jet skies a helicopter that was filming and the ‘Red Rhino’ an antique submarine sag boat that carried friends and family to cheer him on.